Let's ignore the fact it's raining outside as I write this. Last weekend it was hot. SO HOT. Sunny. Lovely. Ethan and I went to our local cinema for Kids Club to watch the most recent Studio Ghibli film on Saturday morning and afterwards Pete and Felix met us and we set off for the seafront. I love living in Clevedon. Yes, it's not the most "happening" place in the world, it's an old Victorian seaside town.. but it is beautiful. We have so many facilties. Yes, not as many as you'd get in the city but I feel we are much better off than surrounding towns. We have a pool, a cinema, schools, playgrounds, nice shopping areas and best of all, our award winning pier and seafront. Did you know a lot of Broadchurch was filmed here? And Never Let Me Go did some filming here and featured the pier on their film poster. 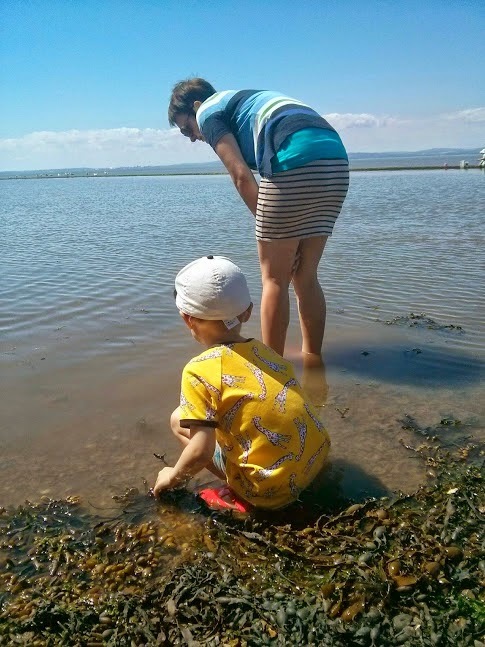 Ethan and I decided to paddle in the Marine lake - it was a bit seaweedy but quite pleasant to stand in and Ethan had a whale of a time looking at all of the crabs other people had caught. 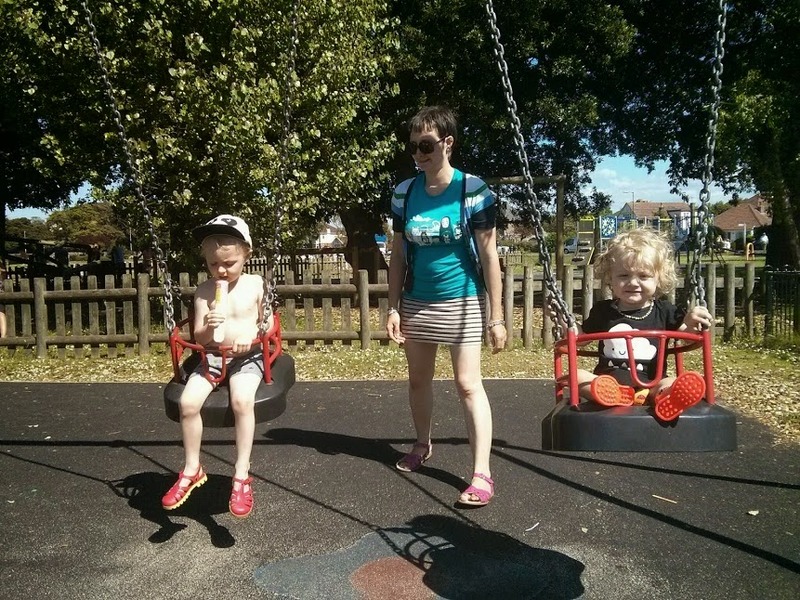 We popped to the playground afterwards and had an ice cream. These are the kinds of days you look back on with the fondest memories, I know from experience. They are the "perfect" days. Even though not every moment during them is perfect (screaming hot baby, dirty nappies, the usual!) but when you look back, it's like you can feel the sunshine on your face, the sounds of happy children, taste the salty air and the sticky ice cream. Precious. I'm doing things slightly different for Trendy Thursday this week - I wrote a fashion post earlier in the week which I'm going to link up below just like anyone else joining in would do, so please look out for my post! 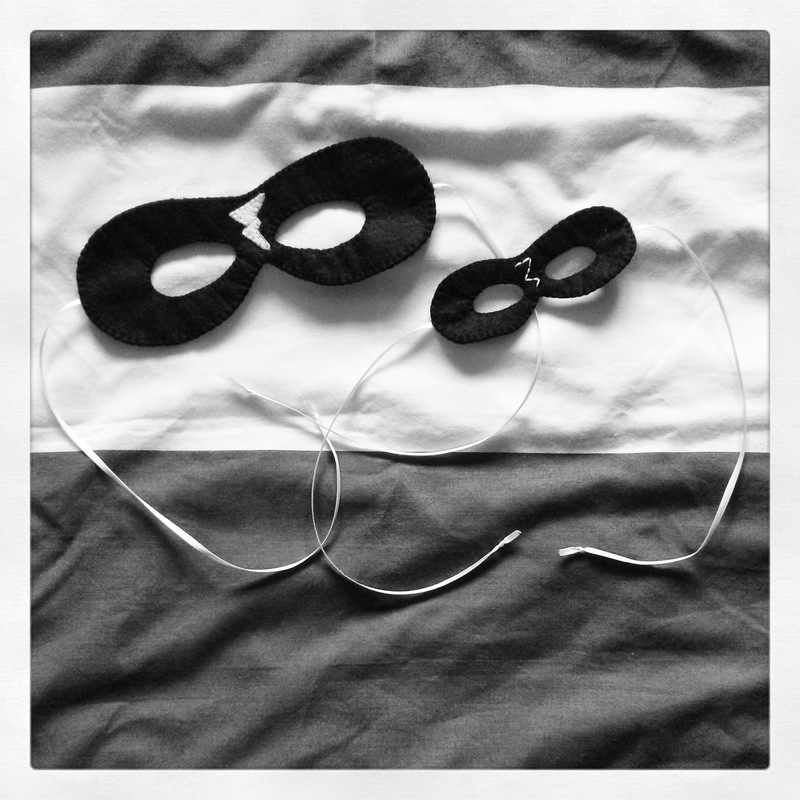 My blog is a little quiet this week. Felix is a very full on baby and for the last few weeks he is only sleeping for 30 minutes during the day which just isn't enough time for me to do anything in, let alone blogging. I'm am stuck with trying to blog at night but because he is so energetic I am too tired most evenings to think about dragging the laptop out and in all honestly, I'm starting to feel chained to the blog. I love it and I'm not planning to stop any time soon, but I just want to warn people it may be a little quieter until he decides to nap properly! He doesn't even sleep through yet either... bloody child!! Something I adore about being a blogger is discovering new brands and being able to share them with you, on the blog, on Instagram, on Twitter, on Facebook, wherever! 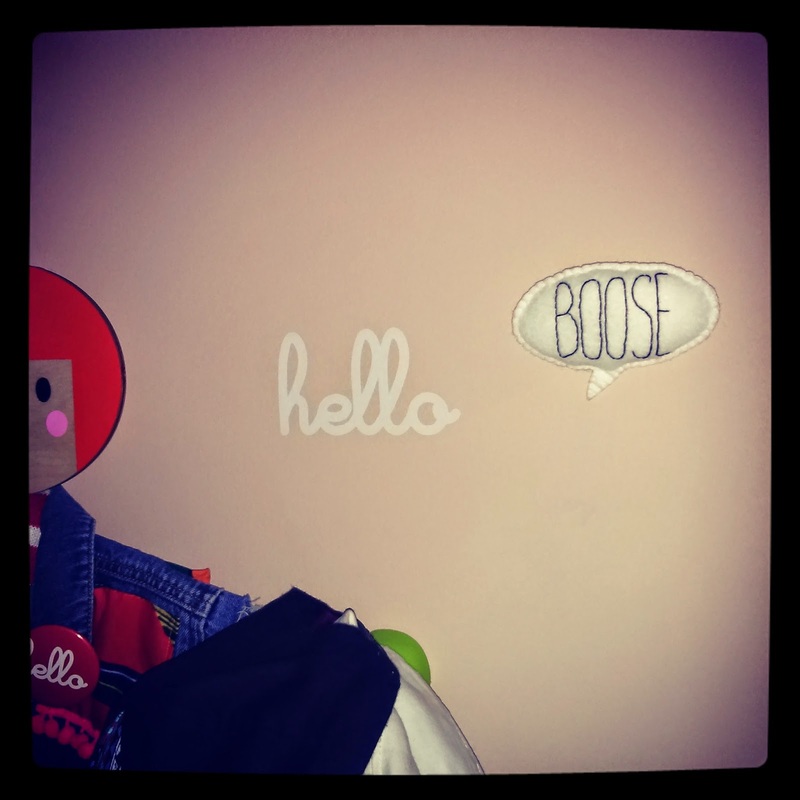 I recently discovered Little Mooshoo who specialise in clothing for children with a retro/70s vibe. Tam, who runs Little Mooshoo asked if I would like to review a couple of items of clothing from her collection so you can bet I said yes! 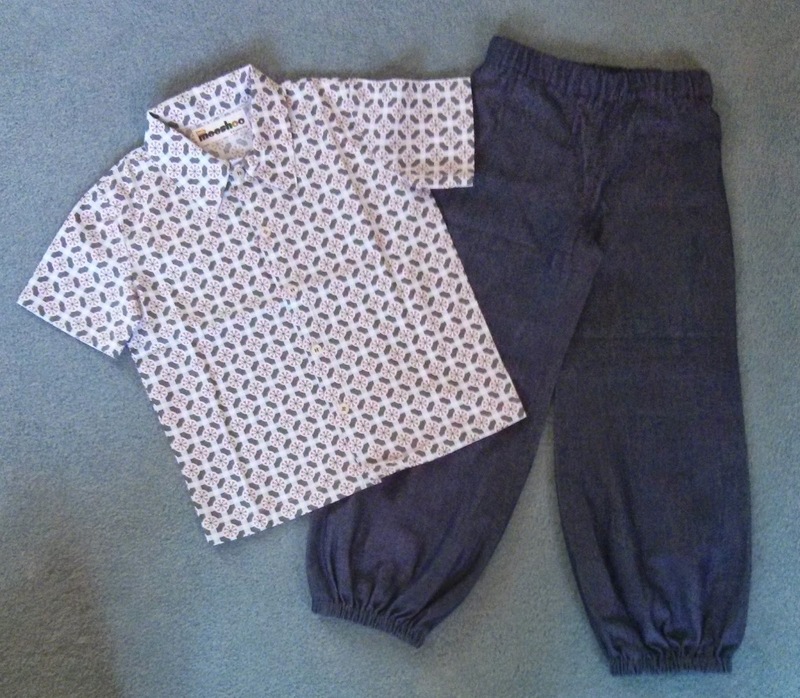 We were very kindly sent a gorgeous retro shirt and a pair of "Alibaba pants" which are rather like baggy harem pants/trousers. As you'd expect, we received the items quickly and packaged up very nicely. I couldn't wait to get Ethan into them, but... and I'm not complaining here (really, I'm not!) 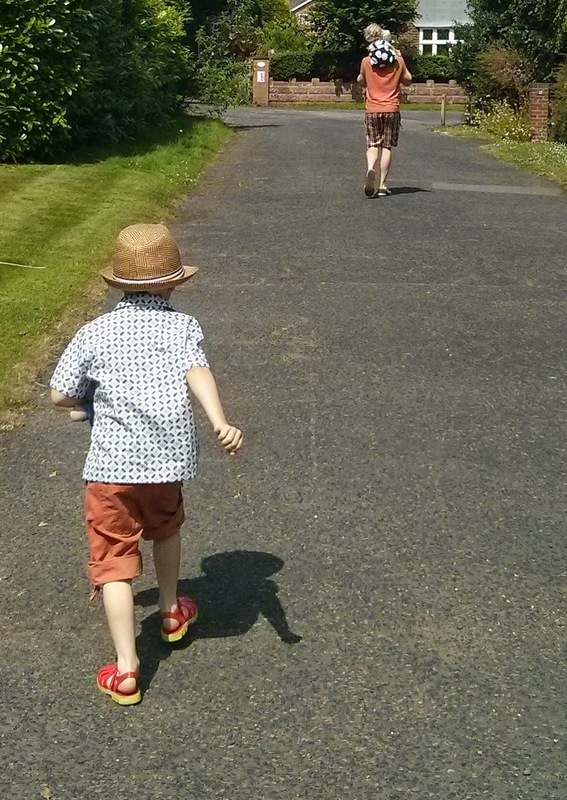 but it's been so warm lately, I've not managed to get Ethan dressed in them. It's not been cool enough to try wearing the alibaba pants but today was Ethan's Great Great Grandfather's 90th birthday party and I thought that would be the perfect time to wear the lovely shirt. Ethan received a complement from just about everyone at the party this afternoon - I'm not just making that up!! People loved it! Ethan loved it too.. The shirt itself is fantastic quality. The material is lovely. Not too thick, not too heavy. The buttons are well attached. It has a pattern so is forgiving when it comes to stains and getting messy.. It's a lovely shirt, something a bit different. Little Mooshoo have more lovely retro inspired stock on their website but I do have a little insider knowledge - new stock will be coming in soon! 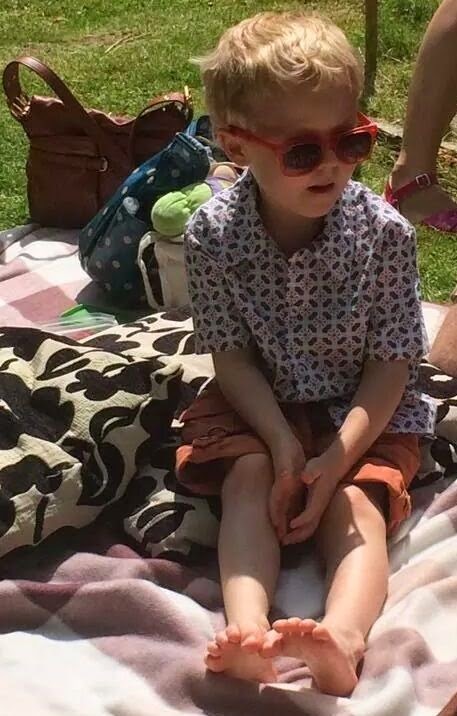 As it's too hot for trousers at the moment I shall save the review of the trousers for another day.. but you can be sure we'll be putting them to use as soon as we can - just want to enjoy this sunshine for a little while longer yet! 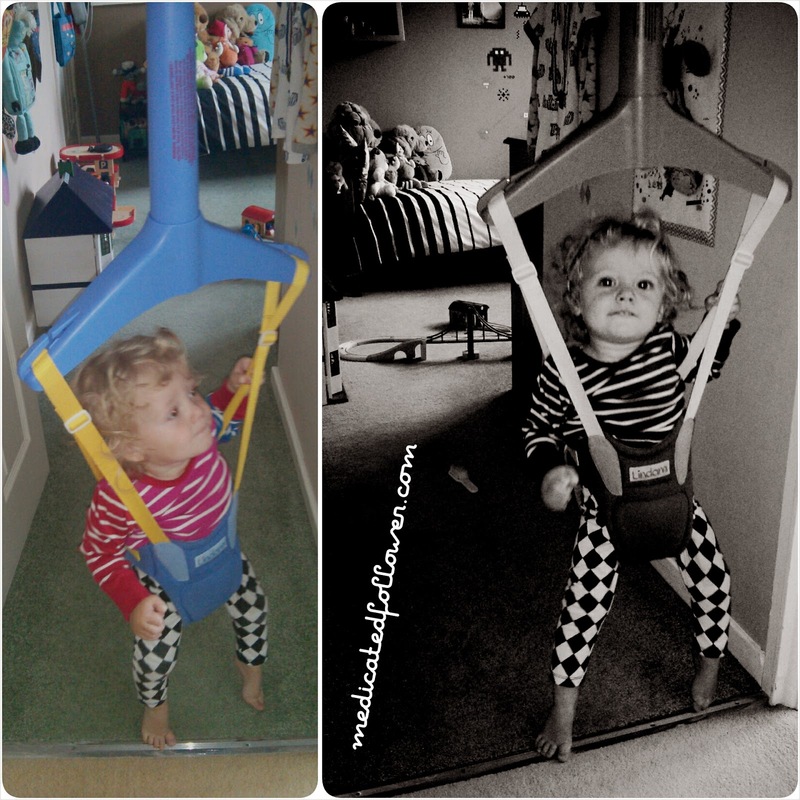 Linking up with My Family Fever for Tried & Tested Tuesdays #TriedTested. Last Saturday we took a little drive from Clevedon over to Shepton Mallet. We've never really stopped in Shepton Mallet before. For my whole life it's really only been somewhere I've driven through (or been driven through) whilst on the way to somewhere else. It was always known to me as the home of "Bambi" as we called him because Babycham was invented and made there - when you drive past the factory there is a huge Babycham deer standing outside. For as long as I can remember I've waved at that deer, or Bambi as my Mum called him. I now ask my boys to do the same.. I digress... A few weeks ago I heard that Shepton Mallet hold a one day festival and we thought it would be a good excuse to go and visit! We weren't let down! The weather was fantastic and there was heaps to do. It was like a glorified village fete. Held in Collett Park (which we discovered is a gorgeous park!) the setting was perfect. There was a large boating lake on which lots of model boats were being displayed. My boys adored this and spent most of the afternoon staring at them. Best of all was a hilarious floating dragon called Lucinda who could speak, blow bubbles from her bottom and squirt "snot" at you from her nostrils. There was a good carboot sale going on, loads of stalls, several bouncy castles, heaps of food vendors to choose from and a stage with live music all afternoon. We found we couldn't get around everything whilst we were there and we stayed until it closed at 5pm. Welcome relief came in the form of a craft area run by the local church. Ethan was drawn to it, he loves crafting, and he spent a good 45 minutes with the lovely lady who was running it, decorating a plate, making a streamer and medal. It was a much needed break from the hustle and bustle and the sun which, whilst lovely, was very hot! We had a fantastic time and said as soon as we got into our car to go home "We'll come back next year!". Well done Shepton Mallet - great work! 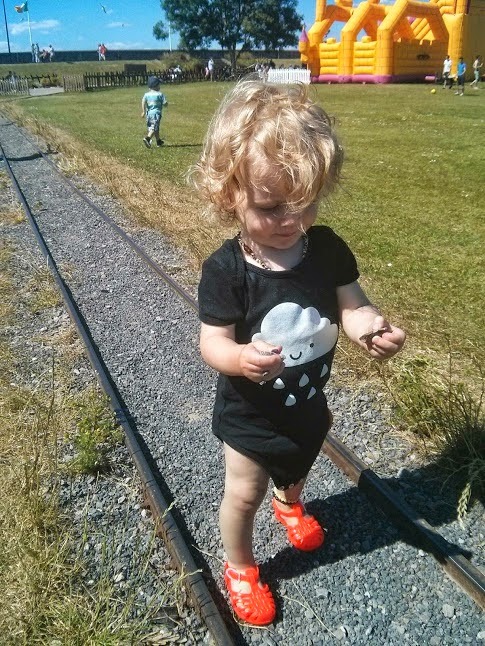 Linking up with Coombmill for Country Kids. Do you follow me on Instagram? You might want to after reading this! 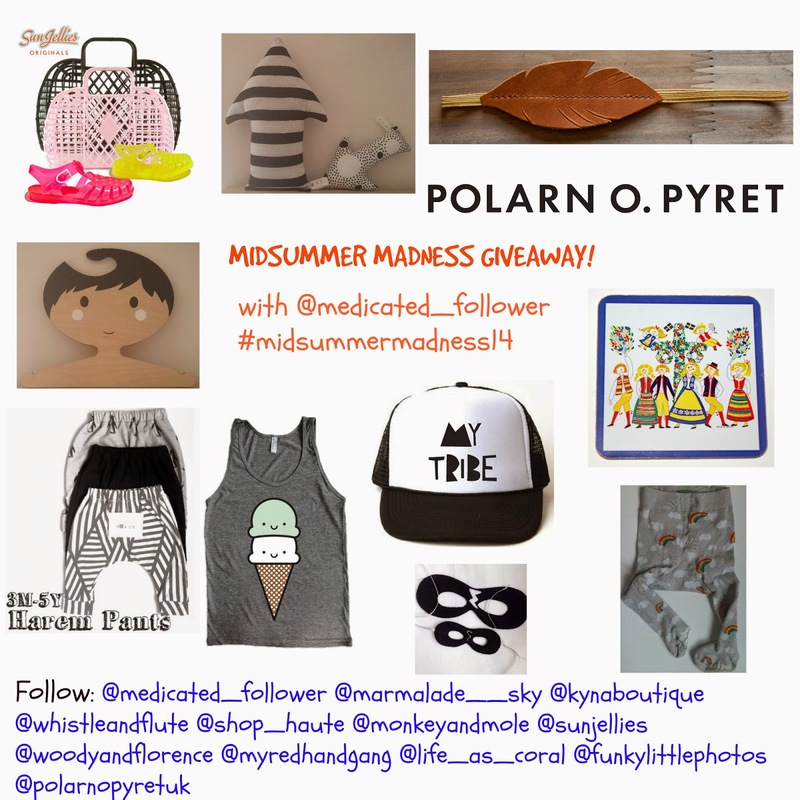 I'm very excited today because I have just launched my first ever Instagram Giveaway. It's something I've wanted to do for a long while now and for the last few weeks I've been putting it together, contacting brands, coming up with a name for it etc. I have been overwhelmed by the generosity of the brands I contacted. Everyone wanted to be involved and as a result I have amazing prizes that one lucky person will win! 4) Share the image as often as you like! I think you'll agree that is quite a set of prizes so if I were you, I'd get on to Instagram right now and get following and reposting! The giveaway will end at midnight on the 11th July. 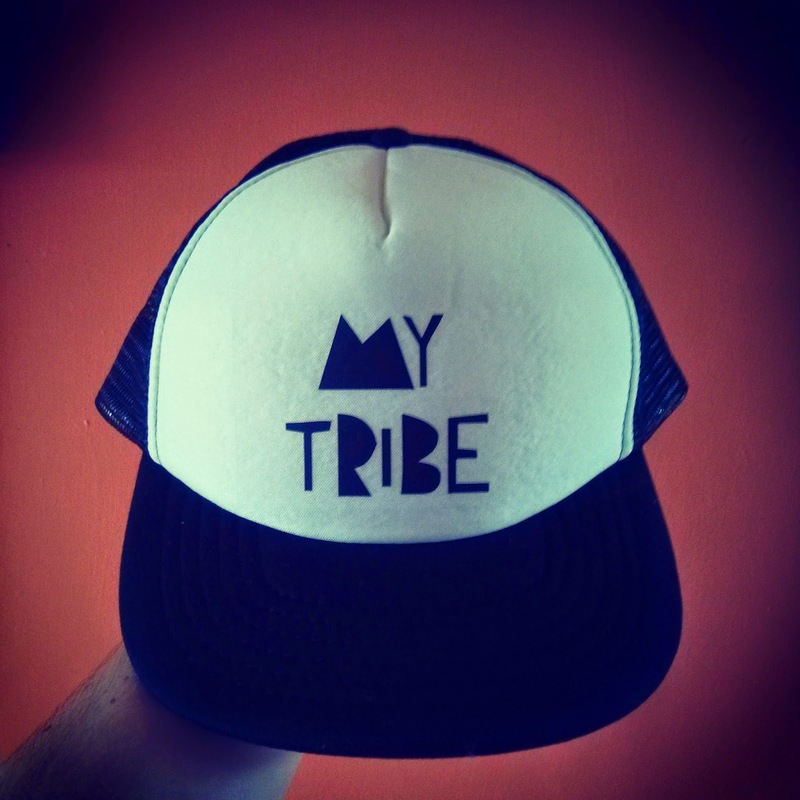 The winner will be announced shortly after (though please give me a couple of days!). Good luck to all entering and happy Summer Solstice! 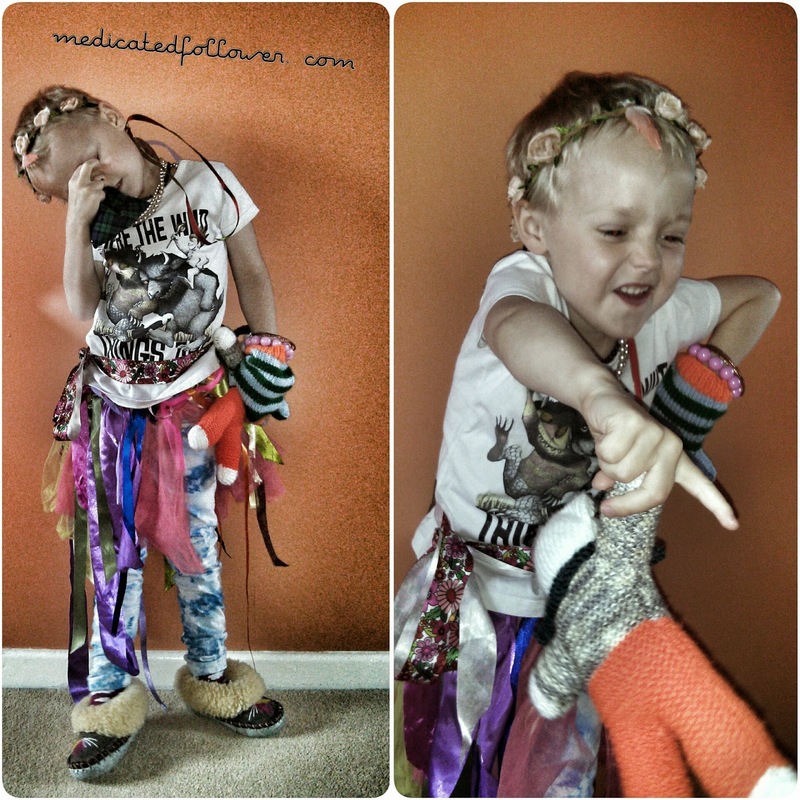 Trendy Thursday - headband tastic! I've been loving all the cool headbands that are available for girls and then it occurred to me - why shouldn't Felix rock a headband? It's not as if I'd get him a bright pink one with huge flowers on it! I found loads of places on Etsy that sell handmade headbands and in the end plumped for some for me from Cristin Rae and one for Felix from Kennedys Collections. 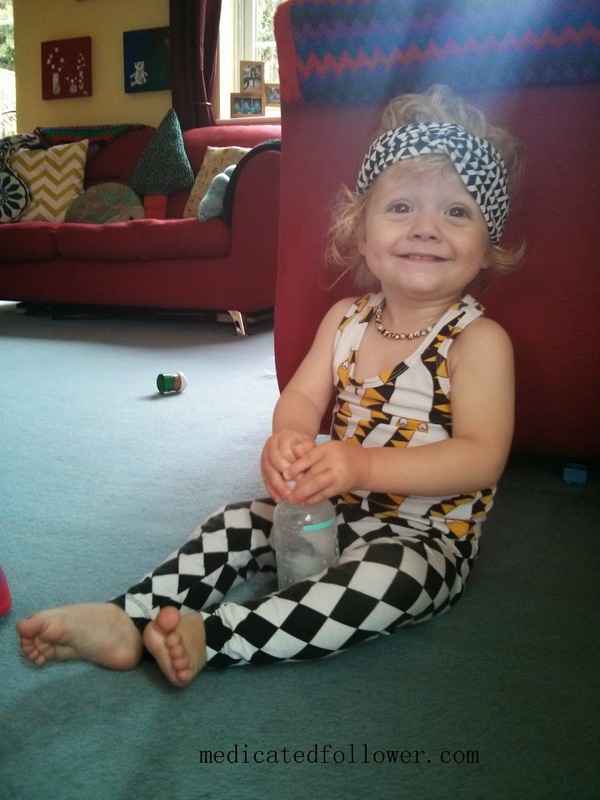 Mine arrived last Friday and I decided to share my geometric monochrome headband with Felix - he rocked it I thought! Felix's own headband arrived on Wednesday so we put it straight on his noggin. I bought him age 18-24 months and it only just fits. Big head. It looks pretty awesome though! Thoughts? Would you put a headband on your boy? 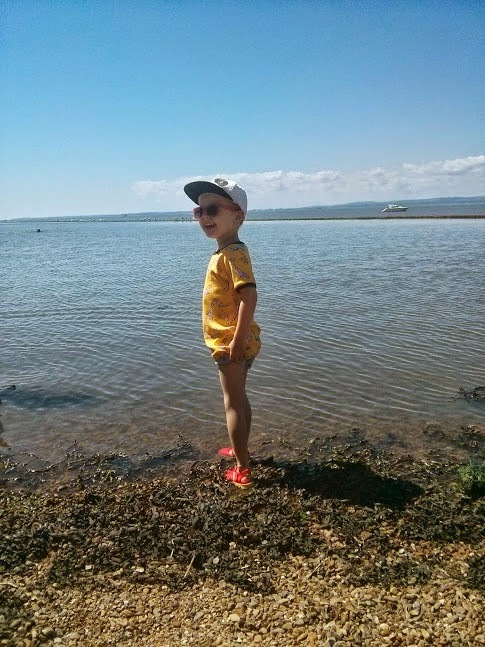 Link up your kids fashion posts below - please don't forget to comment here and check back to visit others who join in - share the love! Getting outside doesn't always mean going far from home. Last Sunday morning we were hanging out in my parents garden. They have a really lovely big garden and Ethan can spend hours mooching around in it. One of his favourite activities is actually something I loved to do as a child - making "drinks" for the adults around! My Mum keeps old flour, tea leaves, coffee, corn flour and any other bits that might go out of date in her greenhouse and Ethan creates "delicious" food and drinks with these. This Sunday he made me some "coffee". Mmmmm. Yum! 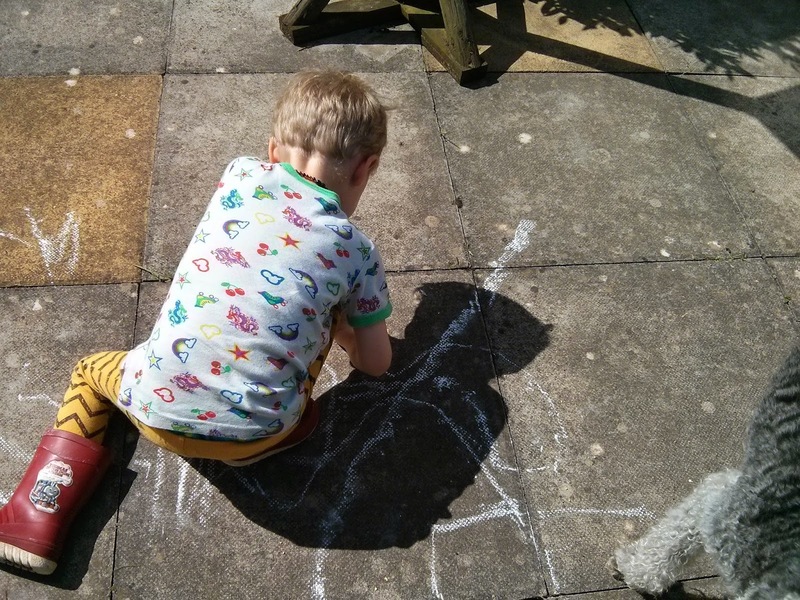 After making coffee, he settled down to do some chalk drawing. It's the simple things that keep them amused really! 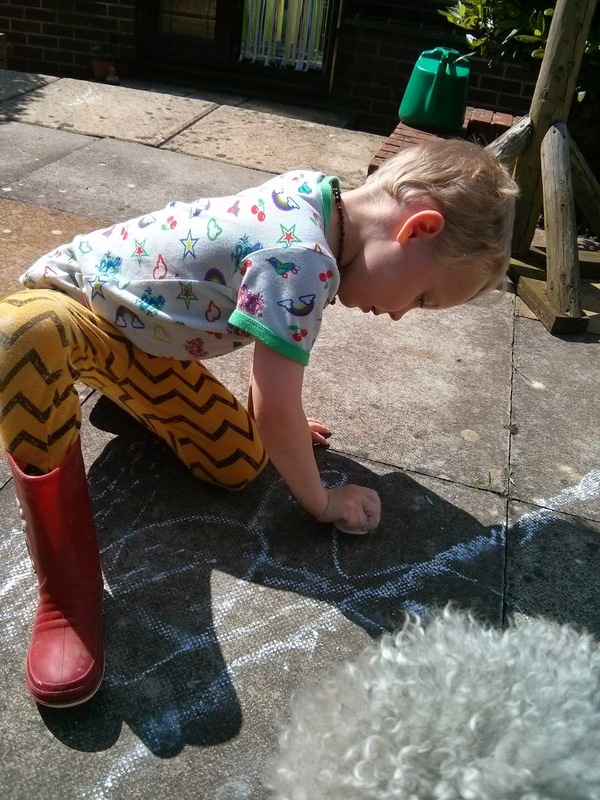 Linking up with the fab Coombe Mill for Country Kids. I know I'm always telling you about where I shop and I know it means lots of you end up spending more money, but I'm sorry (not sorry) I need to ease my own shoppers guilt! I've been following Cissy Wears on Instagram for an age now and what a beautiful feed it is. For ages I've seen the tag #cissysmarmararmy around. 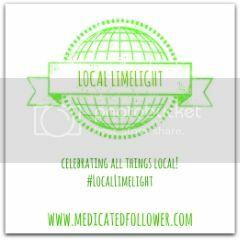 It's used when folks have bought some Mar Mar Copenhagen leopard print clothing and have posted a pic on Instagram. I love children in a bit of leopard print, especially boys, so I knew it was only a matter of time before I joined in. Towards the end of last week I caved in and placed an order. 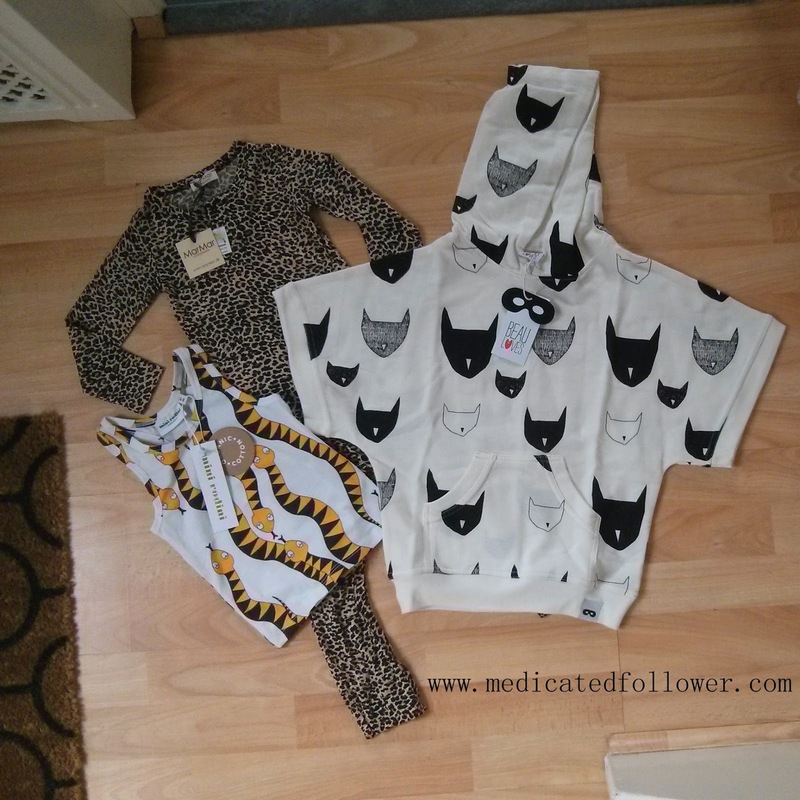 I chose a Mar Mar Copenhagen sleepsuit and Mini Rodini snake print vest for Felix and a Beau Loves hoody for Ethan. How insanely amazing are these items? The Mar Mar is too big for Felix yet but I'm planing to put Felix in the snake vest tomorrow though - watch out on IG! I know he's going to love that one. He loves to make animal noises so no doubt will spend the day making "Sssssss" noises at himself in the mirror. Cissy Wears also stocks books and other goodies so I snuck a book into my order. 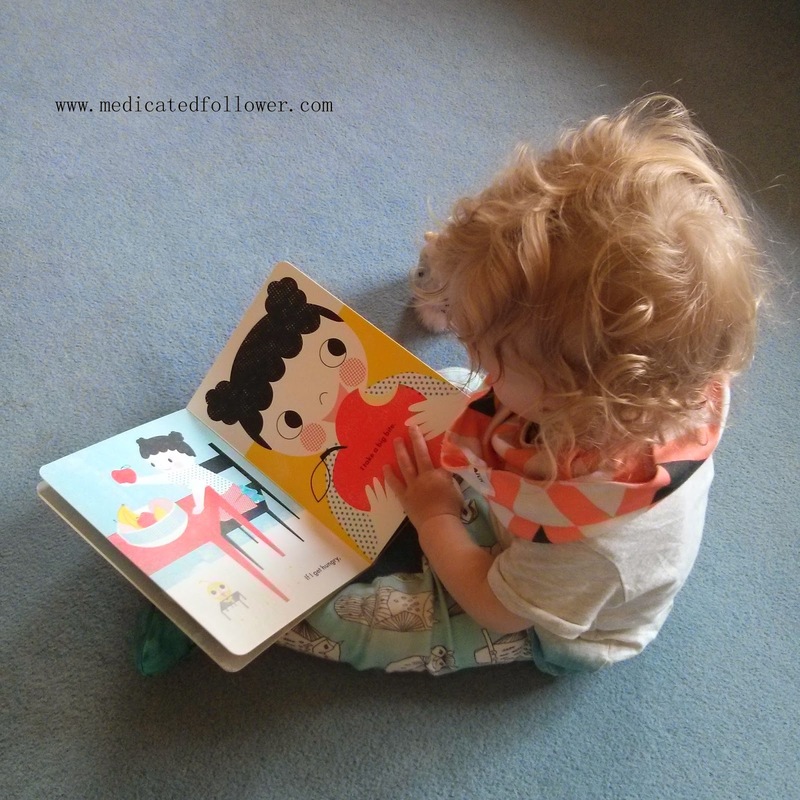 Here's Felix having a read - it's so cute! I have two very movement themed books to share with you today. 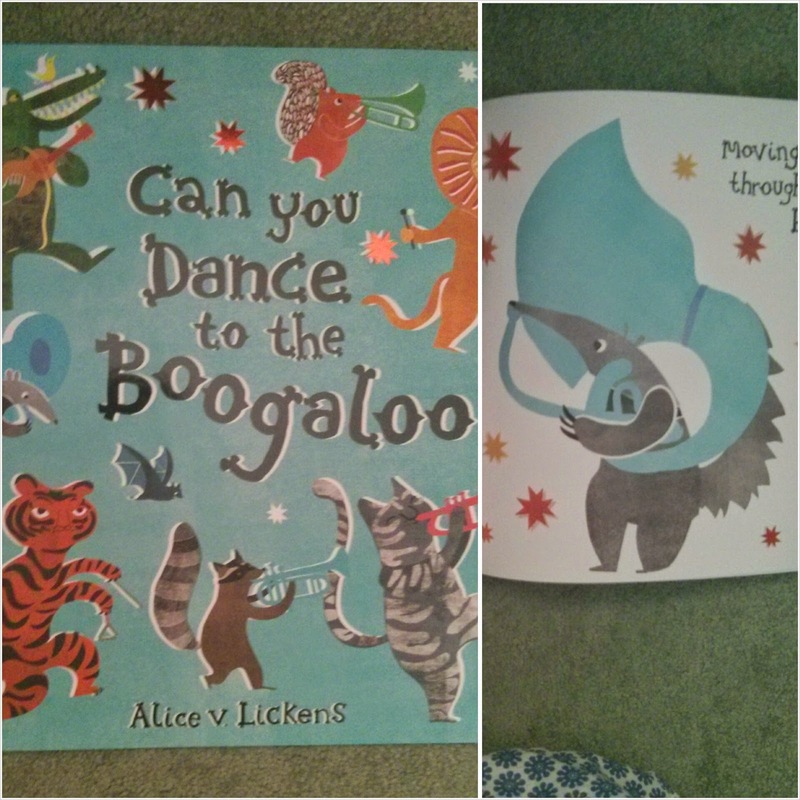 First up we have Can You Dance to the Booglaoo? by Alice V Lickens. This is a fun, brght and eye-catching book that will appeal to toddlers and young children. Ethan is a little on the old side for this book, he does enjoy more of a story these days, but he still happily sits on my lap to look at it and listen! This book makes no secret, it wants you to get up and move around. To dance the boogaloo! We really like the illustrations in this book, they are funky and bright. There's quite a bit of detail in the drawings to attract the eye. I like how it details quite a few different instruments, I think it's great to introduce them to children. Both of my boys are into music and instruments (probably the most played with toys are the keybord, harmonica, ukukeke and drum) so I think this book appeals to them. It's just a fun book! 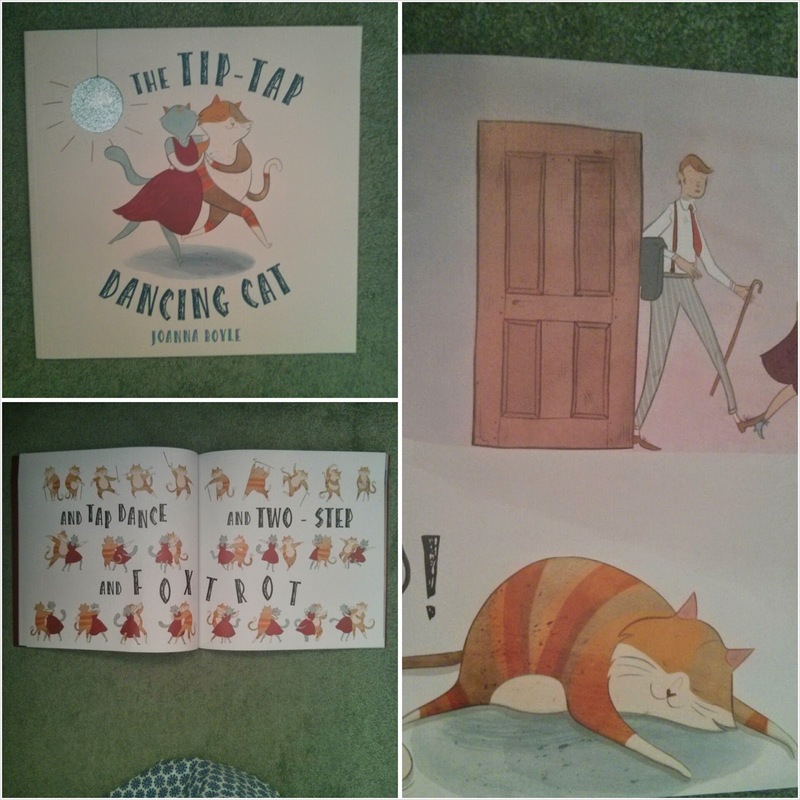 Secondly we have The Tip-Tap Dancing Cat by Joanna Boyle. We like this book. More dance focussed that music focussed. The story focusses around Oscar the cat who has a secret - when his owners are out, he likes to dance! He'll try any style of dance. This is something I like about this book, loads of style of dance are detailed from Salsa to the Two-Step. At the end of the book there are two pages explaining a little about each dance style - very informative! Again, this is a book that appeals more to younger children, the story isn't that deep. The illustrations are cool though. It's nice to look at! Both books are published by Pavilion Books and retail at £5.99 each. Look. I don't want to scare you, but Father's Day is really close.. like days, just DAYS away! Don't worry - I'm here to share a few of my gift ideas with you! Luckily this year, I had a rather inspired idea for Pete's Father's Day gift, a little something handmade from the lovely Velveteen Babies. I am loath to say more about that though in case he reads this before Father's Day. If you follow on Instagram then you'll be able to have a sneak peak at that before the day itself. As we are so close to the event, I'm going to concentrate on things you can get in local shops or make at home. 1) An excellent quality shaving cream. OK - I know this doesn't seem very exciting, but this might just be a life changing experience! About 18 months ago Pete was given a tube of Crabtree & Evelyn shaving cream. It didn't seem like a very fun present, but it changed his shaving routine for the better. Pete has always struggled to get a good clean shave free from cuts and ingrown hairs. Since changing to this shaving cream all of that has become a thing of the past. It isn't cheap at £12 but it really lasts. Pete has only just finished his second ever tube of this cream. When he used cheaper shaving foam we were buying a few one at £3-4 every few weeks. He really rates this stuff. And he is a man. With a face. That needs shaving. So he should know! 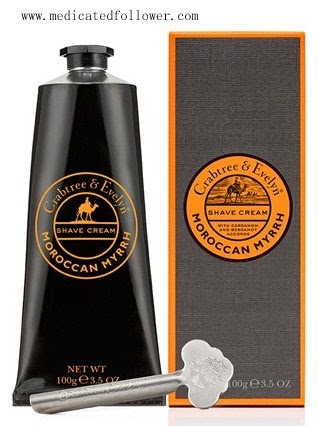 You can buy this in a Crabtree & Evelyn shop if you have one near you, or Ocado stock it should you shop with them! This is an easy one, and one the children can get involved with. It's also something that goes down very well. After all, as a parent, there are very few lie ins! Ethan loves to do something like this, he loves to help cook eggy bread and make a cup of tea. You could even take it up on a tray with the newspapers and a flower - cutesy!! Come on, it's the essential all time favourite, isn't it!! If you're really lucky, they might have already made one at school!! If not, it's simple. Card or paper and pens is the minimum you need. You can obviously get more creative. Ethan made me a Mother's Day card at school this year and it made me cry it was so beautiful. I'm going to treasure it forever. 4) A big family gathering. 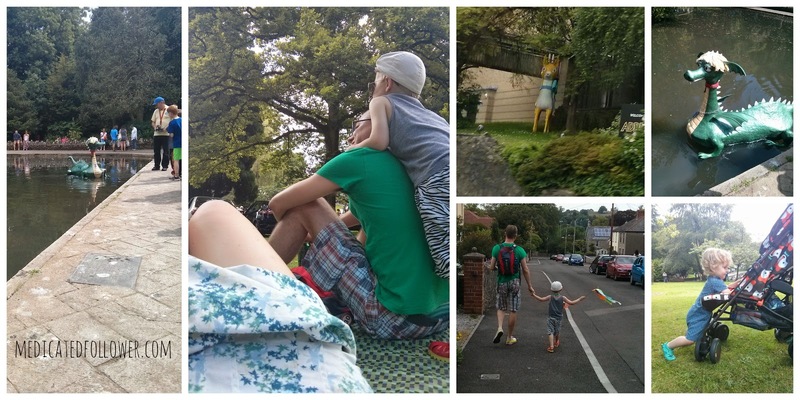 We love doing things as a family and it's even better if you can get extended family involved. Something we have struggled with since becoming parents is that Mother's Day & Father's Day means somehow fitting in visits and presents for us and the Grandparents. We end up trying to rush around both sets of Grandparents whilst trying to make the day special for our other half. It's not easy. Our solution is getting together with as many of the family as possible. You mark the occasion and everyone is in one place together. 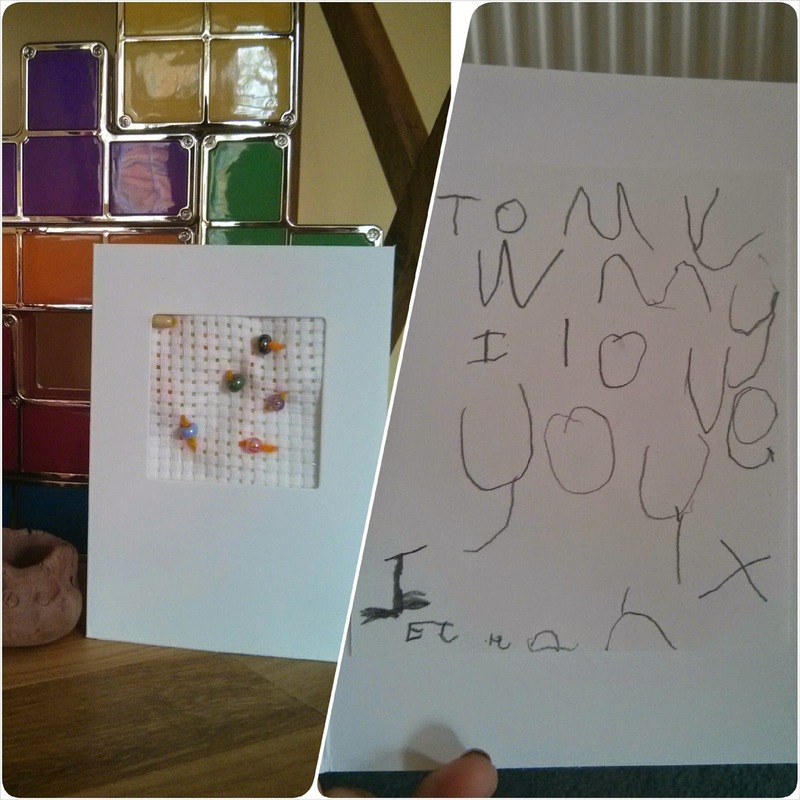 Better still, Grandparents are more than happy with the gift of seeing their Grandchildren and a handmade card. Cheesy but true. We sometimes even get together with my brother's partner's family as well because of course they want to celebrate the day too! It's a great chance to go somewhere for a picnic or a BBQ. 5) The classic gift set. It's a little bit of a treat and something they might not get for themselves. You can easily buy a selection of things and make up a nice box of treats. Something I have done for Pete in the past is buy a gorgeous pair of quality socks. I know it's a bit of a stereotypical man gift, but he normally buys himself a multi pack of Primarni socks. Now he has a favourite pair of gorgeous quality socks that make him feel a little extra special when he puts them on. You could add to the package some chocs or sweets (Pete is a sucker for sweets!) and something along the lines of bubble bath to soak their aching body (we all know what lugging around small children/cycling/gardening/generally being over 30 do to your back) and something to spruce themselves up with. Radox have some yummy smelling bath soaks and bubbles. 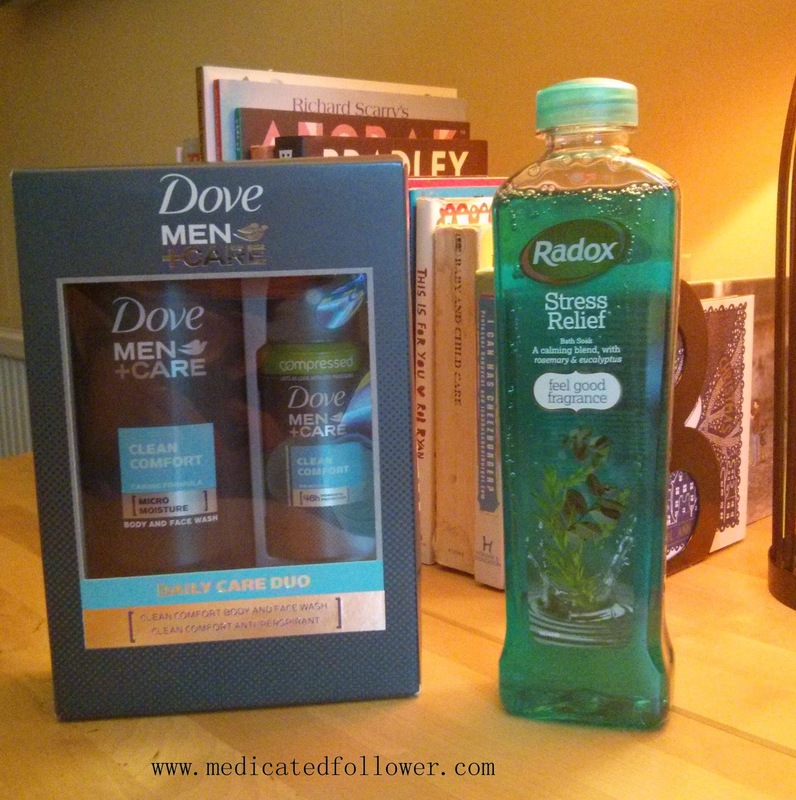 Dove have some gift sets that cover all the different "Dad Types". Sorted! Right then - stop reading this and get organising yourself!! 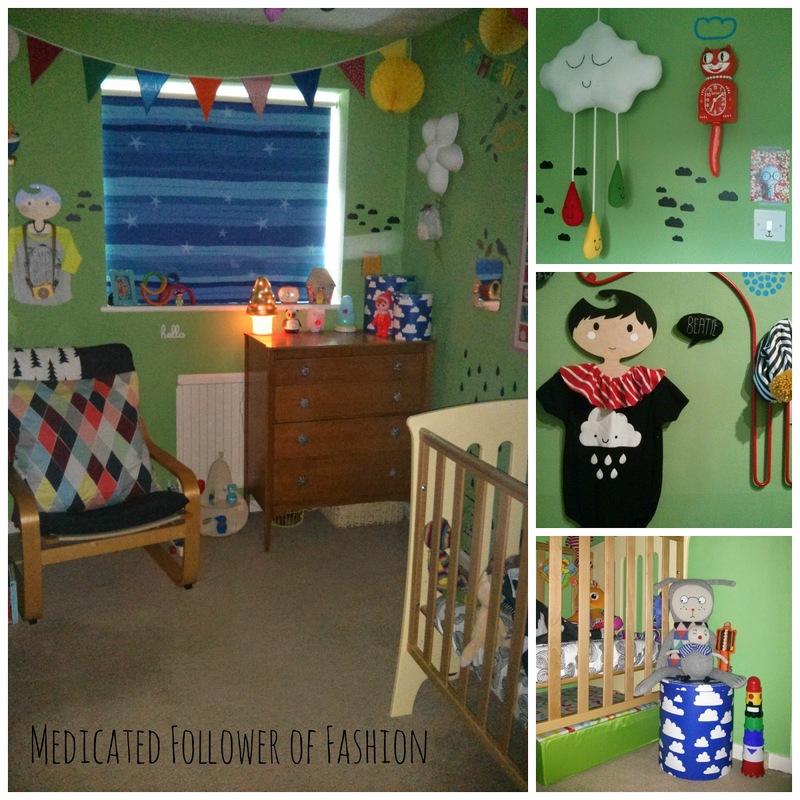 For SO LONG now I have been planning to feature the boys bedrooms on the blog. Out of all of the rooms in our house, they are quite possibly my favourite. I enjoy being in them and I have real fun decorating them. One of the reasons I've held back on writing about them is that they never seem to be "finished" or "perfect" but I've come to realise they probably never will be. After all, they are children who are growing and changing every day. Their rooms reflect that! 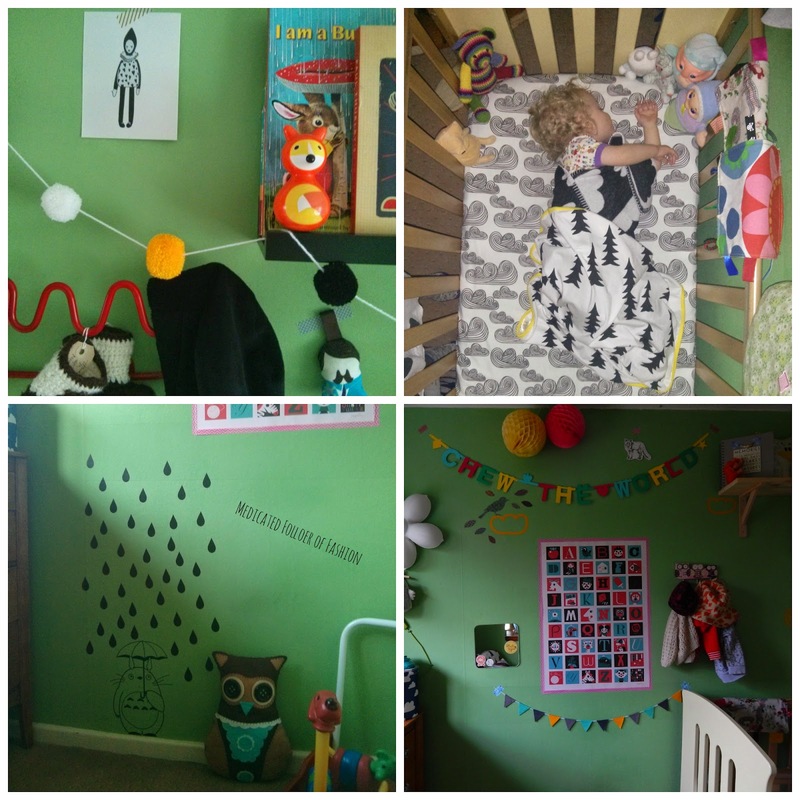 There are two things that I would like to change in Felix's room to make it feel more "finished" in my eyes, but I can't see that happening any time soon. I would like him to have a cotbed and I have the perfect one in mind. 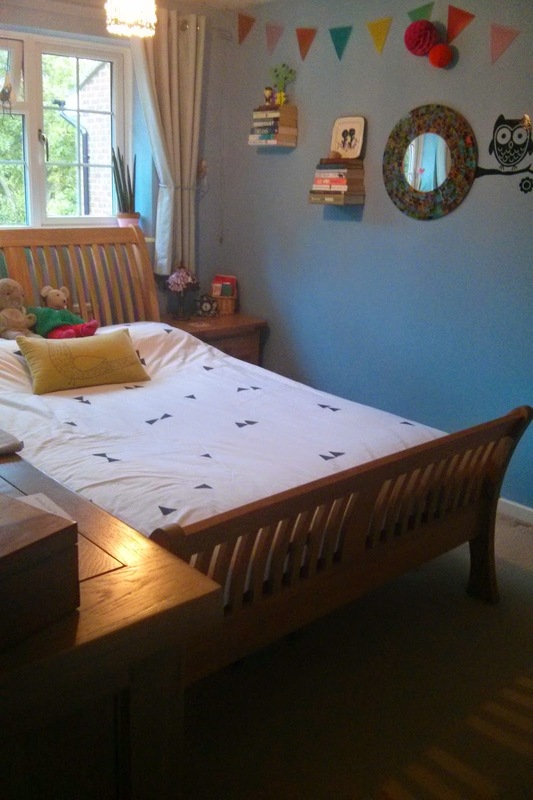 Cosatto sell two beautiful cot beds and either of them would look amazing in his room. I have my heart set on the Babushka though. Why do I want one of these? Well, they are a little bigger than a cot so will last him longer. What I'm really attracted to, though, is the storage space. They have draws underneath them. 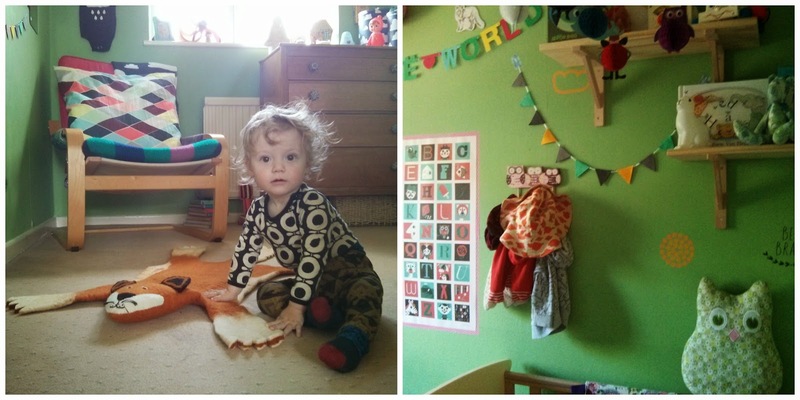 Storage is an issue in Felix's room because there is only space for a chest of draws, not a wardrobe. All of his clothes and cloth nappies have to fit in there. Extra storage that is purposful and tidy under a cot bed would make a huge difference. The second thing I would really love to change is the carpet. A few days ago was the 10 year anniversary of the day we moved into our house and apart from the living room carpet, the carpet in Felix's room is the only other one we haven't changed. It's not bad quality but it's not a style I would ever pick. Firstly, it has a really dated pattern on it. Secondly, it is covered in marks and stains. Really covered. I don't like it at all. Every time I go in the room I feel it brings it down. I would really like something hard wearing in there instead and there are some amazing hard wearing and forgiving carpets you can choose from these days. 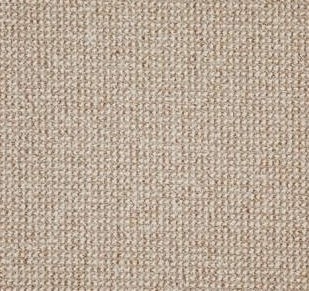 Having had a quick nosey on the Carpet Right website this evening, I've picked out what I would go for. Something that will work with all of the colours in the room (we do like colour in our house!) and something that will be very forgiving when it comes to stains. I have to be realistic, what with it being a child's bedroom, stains are inevitable. Just think about what happens when you have a screaming feverish baby in the middle of the night and you're trying to doll our calpol in the dark..
Due to the two tone pile, it'd be very forgiving! Well.. on to the main event. Felix's room as it stands. I really am very proud of it, I feel it's such a happy space. There is such a lot going on in this room which I know won't be to everyone's taste, but I feel it makes a good reflection of a child and in particular, my child! The walls are quite a bold solid green colour. We actually painted this room green when I was pregnant with Ethan, we felt it was a good colour for a young child. Since then, fashions have changed a little and it seems paler walls or even white walls are much more in, but I can't see us getting around to painting any time soon, and whilst it is a statement, I do think it still looks good. Felix's chest of draws I found in a charity shop when I was pregnant. We sanded them down, re varnished and attached some cute new draw knobs. A nice easy facelift! I love the iconic Farg Form cloud print and found these storage boxes on offer at The Pippa and Ike Show. They have proven to be very useful. I keep nappy changing equipment in the middle sized one and medicins/creams etc in the smallest one. 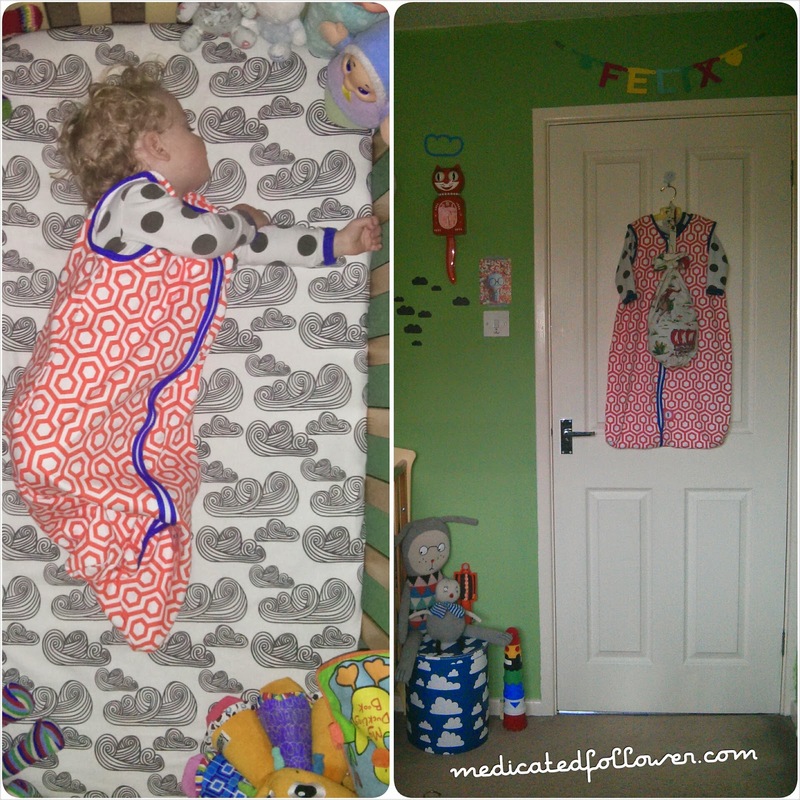 The largest one has bandanna bibs in at present! Felix loves "cat clocks" so we bought one with his birthday money which really made his day (week, month, year!). He enjoys watching the tail and eyes move. Orange looks gorgeous against the green walls we think. You can't have a child's room withiout some Lucky Boy Sunday cuddlies. Fancy Nulle is just about the best cuddly ever. He's pretty much the same size as Felix at the moment and so soft. Felix likes to roll around the floor with Bow Jovi, kissing him.. 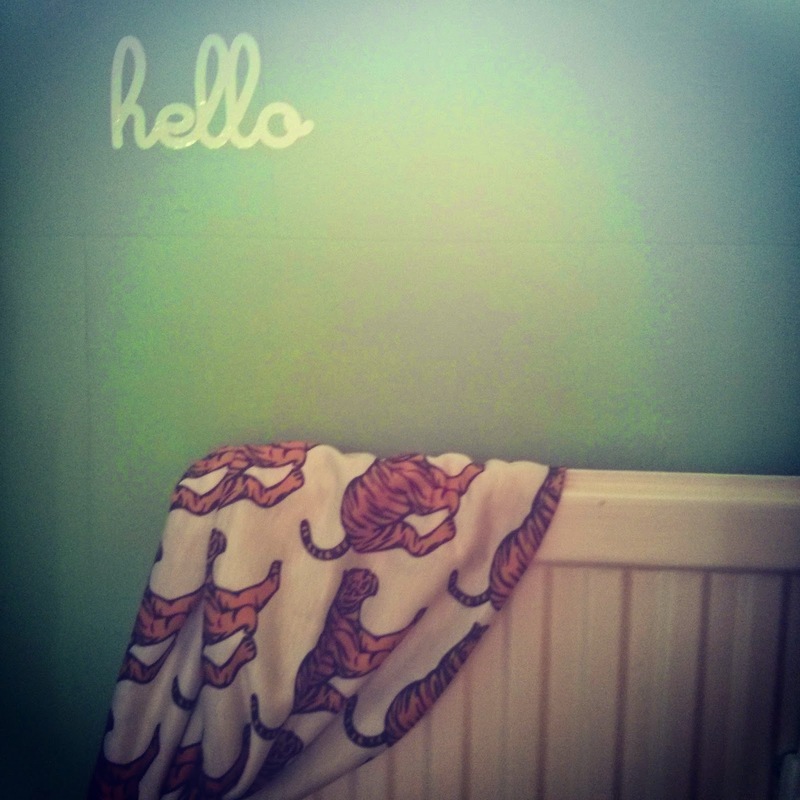 I'm a bit obsessed with wall stickers (or decals as they are often called). Why do I like them so much? Well, they are a quick and easy way to update a room. Many of them are easy to remove and are even re-positionable (or, in my experience, even if they aren't officially re-positionable, you can move them around if you are careful!). Felix has heaps of wall stickers in his room. 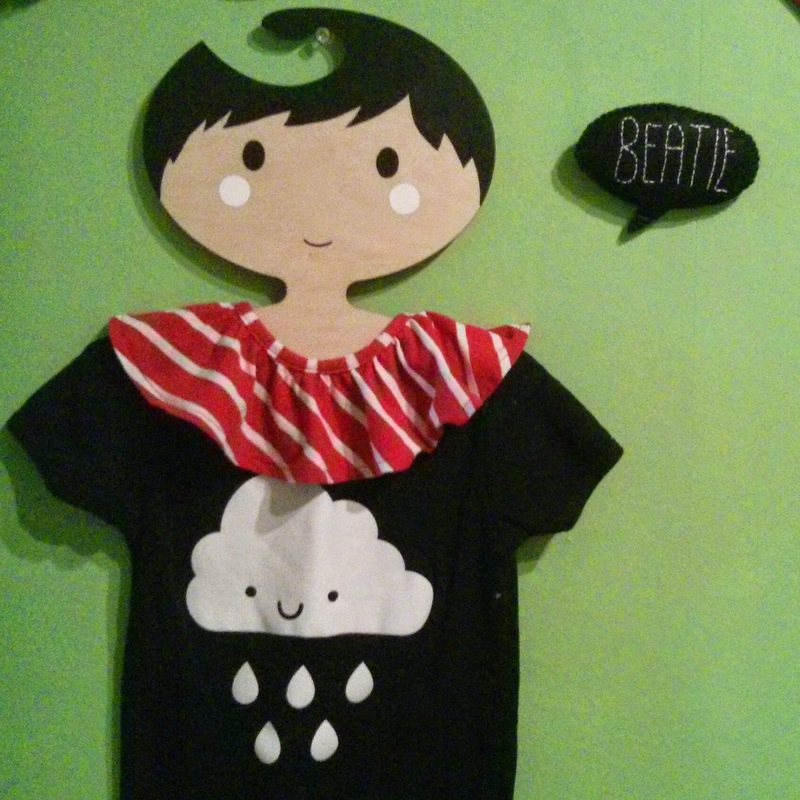 As you can see above, there is a cute hello from Hello Apparel via Southwood Stores. The birds & leaves I bought a long time ago and in all honestly, I can't remember where. 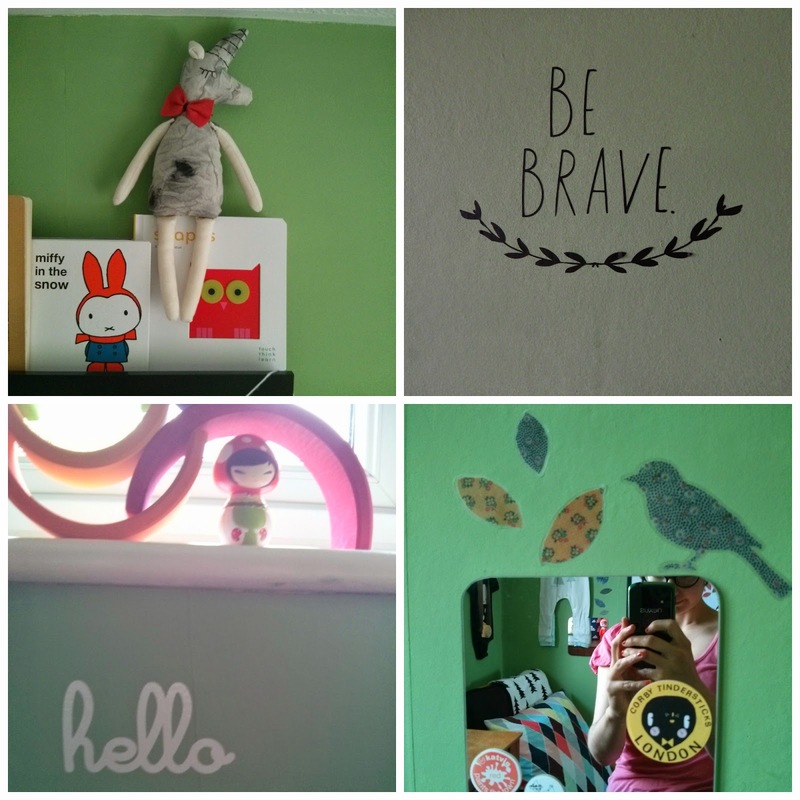 The Be Brave is a Shanna Murray design stocked by Deco Baby. I love this one. It's simple, sweet and inspiring. 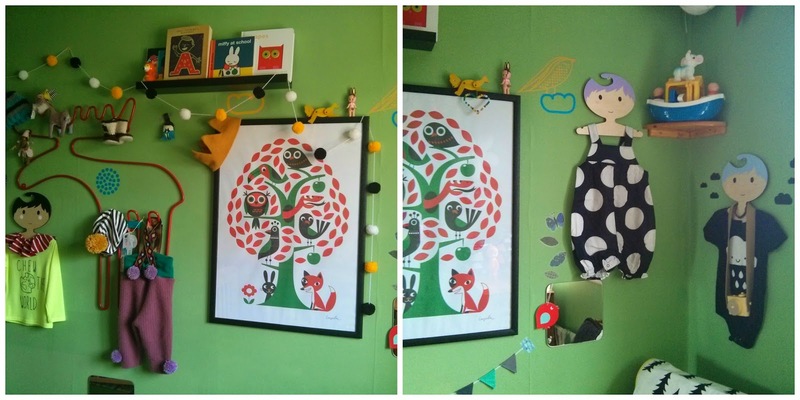 We also have a huge love of Totoro and other Ghibli films in our house so you will find a great many soot sprites on Felix's wall. I found a gorgeous Totoro under an umbrella on eBay which works perfectly with Farg Form's raindrops. Speaking of Farg Form, look closely and you'll see some of their cloud stickers on the walls too! I adore displaying Felix's clothes. Items that are especially beautiful or perhaps too big from him yet. That's where the Red Hand Gang come in handy. Abi makes these beautiful hangers which are perfect to display clothing. I even had my own one commissioned!! Even just looking through pictures of this room I can see how much it changes week on week. Mostly because I buy new additions for it like the pom pom garland from Woody & Florence. Run by Chloe, you'll be hard pushed not to want to buy everything they make (which is why I've had to ask her to make me some bedding!!). 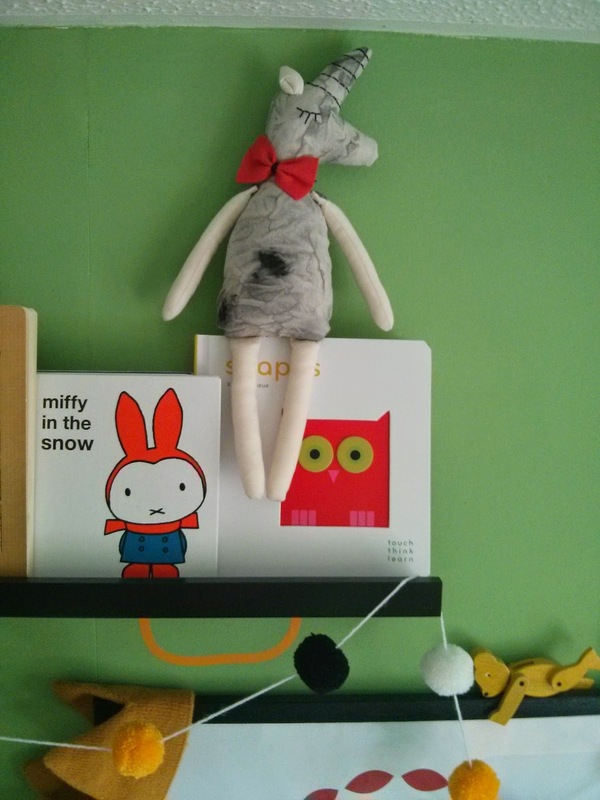 Some things I have to move around because Felix's is getting taller and more able to pull at things but not old enough to fully understand being asked not to do something... the tiny felt bunting has had to move around a few times. How amazing is the fox rug? Felix has a bit of a fox theme, he's my Felix Fox. I had to get this for him when I saw Molly Meg stocked them! There are just so many items in Felix's room I don't think I could list them all. I will include a list of my favourite stores to buy from at the end of this post though. How would I describe the style of Felix's bedroom? Hmm.. Most of my house I would call scandi-shabby-chic and I suppose this is in a similar vein. There is no doubt I am very inspired by scandi style but I don't have the white walls they often do. I do love white walls but am somewhat frightened of them in children's rooms! I plan to share Ethan's room soon and probably other rooms in the house if this is well received. I adore decorating my home. It's not what I'd call my "forever home". I'd like a 1930s property ideally but until I am working we have to stay where we are. We are lucky, we have three bedrooms and it is a good size. So, what's fashion for boys then? I went to a fantastic blogging event this weekend, the South West Blog Social created and hosted by Jodie of A La Jode and Albertine of Dippy Writes. I had a wonderful time- more on that in another post! Going to a blogger event, you meet lots of bloggers. That's a given. There are so many different categories of blogs out there, it's incredibly interesting to speak to those who write under a different subject. I love how these events can help us understand each other a little more but they do throw up some interesting questions. "So, what is fashion for boys then?" You know... I've never really thought.. I just feel that fashion is for everyone. For me, it's not so much about "fashion" in as much as mindlessly following the latest "trends". It's about expressing yourself. I want my boys to be able to express themselves. To be comfortable to wear whatever they like with pride. To be themselves. I don't want them to be frightend of colour or pattern, to be constrained by what society or the media says is acceptable to wear. Obviously I'd prefer them to look classy! Ha..
As I said to a few bloggers yesterday " Well, my son has gone to a birthday party this afternoon with a Wall:E outfit on his top half & a pink tutu on the bottom". 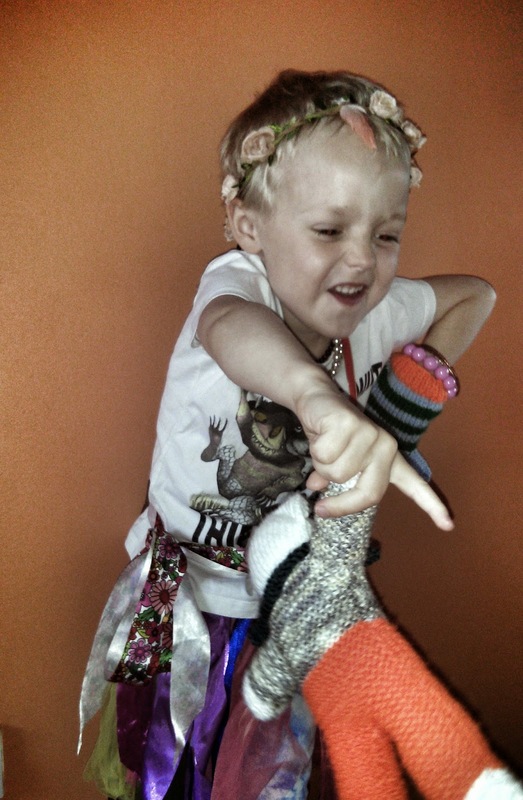 I am pleased he is still happy to wear what he likes at nearly 5.
" I was glad I had a boy, I was relieved I wouldn't have to spend so much money on clothes or worry about fashion! " I had to laugh at that. First of all, I probably spend more on clothing for my boys than most mother's of girls!! That's my choice of course. Secondly though, what's with all the gender stereotyping? It's like saying "I'm glad I had a girl because now I won't have to worry about supporting someone through Uni so they can become a Dr!". OK. Maybe not so extreme... But it's the same thought process! We don't know who are children will be when they are handed to us after birth. We can only support them to the best of our ability and hope that we allow them to be whoever THEY want to be. So. What's fashion for boy's? Well, what's fashion for girls I say! It will always just come down to fun & expression for me. Which is probably why I spent a year wearing a red spandex cat suit aged 12! 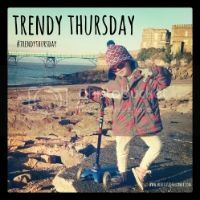 Trendy Thursday - one day late! What a week we have had here.... last week was half term, which was nice in but very busy and I had very little time for the blog. This week I was looking forward to getting back to normal, but of course, life is never so simple. On Saturday night Felix woke during the night with a raging temperature of 40 and a fractious night and day followed. Come Sunday evening, Ethan was showing symptoms as well. Both boys have spent the week seeming to get better and then go downhill again. Yesterday I sent Ethan back to school because his temp had stayed down and he seemed perky. However, at lunchtime I received a call from school asking if I could collect him (thank goodness I don't work!) because he was lying down in the playground and feeling ill. Poor sausage. 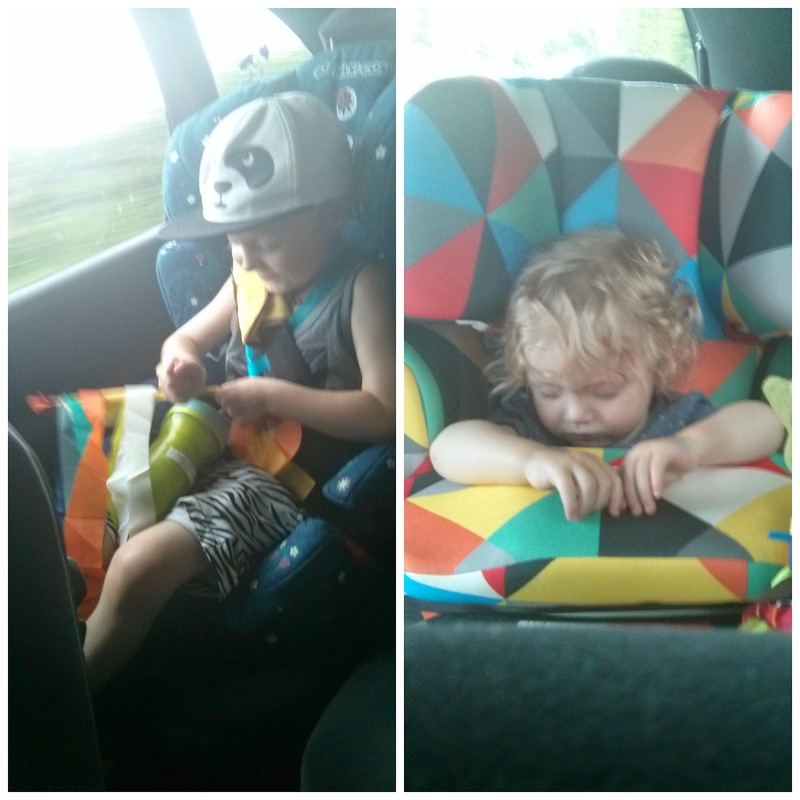 I collected him straight away in the car (dragging a moaning and also poorly Felix with me) and we drove home. As we parked up on the driveway Ethan started moaning and groaning, clutching at his chest and saying "My body! My body! I feel SO poorly! It hurts!". 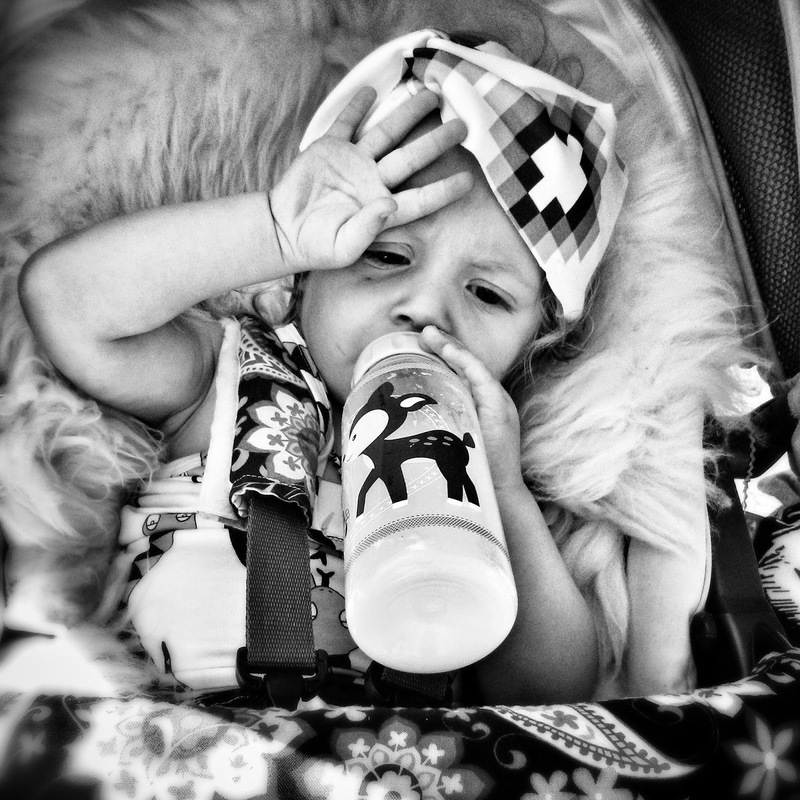 As you know, being a Mum, I could tell straight away that he was going to be sick so I dashed out of the front of the car to his side and offered him my hands - what else had I? He proceeded to projectile vomit all over himself and the car. My hands didn't help in the least. I couldn't believe the mess!!! I had to strip him down, wash him off, wash the car. Even his lunch box and book bag got covered! It took me an hour and a half to clean up. Suffice to say that at this point, a Trendy Thursday post was out of the question. The rest of the day passed quickly in a blur of caring for the boys. Thank goodness my parents have taken them both for a few hours today so now I have some time.. and boy am I busy! I know it's a day late and probably won't attract as much attention as it should, but I didn't want to miss out so here is this week's Trendy Thursday. Not a huge amount to showcase, due to the illness!! I have some rather gorgeous finds to share with you now. If you follow in Instagram you've probably already seen them, but I want to show them off here too. First up, this beautiful sleeping bag from The Bright Company. They have had their bedwear reduced this week so I had to take advantage of that. This bag is 6-18 months and is beautiful. I wish it were a little bigger so it would last longer but really, it's just so fantastic! I love Bright Company patterns. How about Felix's cot sheet? Amazing isn't it! This is from Candy Kirkby Designs and I'm afraid it cost me rather a lot to purchase and import but honestly, it is something special! I think it's my favourite of his sheets. As he's in a sleeping bag and not using a duvet, I like to have something cute in there. How about the Kit Cat Klock on the wall? We have a black Kitty Cat Klock at the bottom of our stairs and Felix has been obsessed with it since birth. One of his first words was clock and he loves to stare at "CaT CloCK" (caps for emphasis!) as Felix calls it. We used some of his birthday money to get one for his room and it makes him grin every day. I purchased it from a rather lovely eBay seller who imports them - they are quite hard to come by in the UK and he is one of the nicest most helpful eBay sellers I've ever "met". We had some trouble hanging the clock and getting it to work due to the walls in our house being wonky and I also dropped the tail. Totally my fault but he has sourced a replacement tail for me for no extra cost. That's customer service folks! Have you heard about Studio Escargot? Apart from having a rather wonderful name, they, or rather Sophia makes the most beautiful dolls you have ever seen.. They are truly beautiful. She recently shared a picture of a Unicorn she had made on Instagram and I just knew we had to have one. I had to wait a few weeks because she was so busy, but our Unicorn arrived this morning and he was totally worth the wait. Felix is a little too young to play with him carefully enough yet, so for now, he's sitting on his shelf looking after the books. He's gorgeous! A couple of weeks ago on Etsy I came across Velveteen Babies. I am such a fan of this shop. I want everything that Coral makes. I bought two of her cute speech bubbles, one for each of my boys, with their nicknames on. 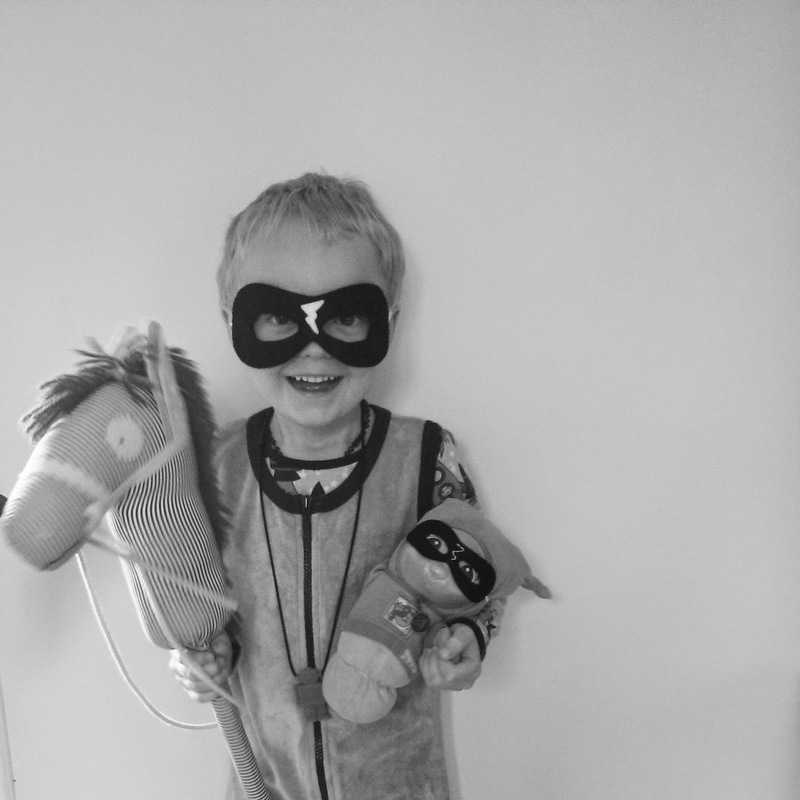 I also purchased a Superhero and Sidekick mask set for Ethan and Gloworm to play with. I think Coral's items are fantastically priced for handmade original items and I may just have commissioned her to make a little something for Father's Day! Right - I think I have shared enough with you lovely lot for now! 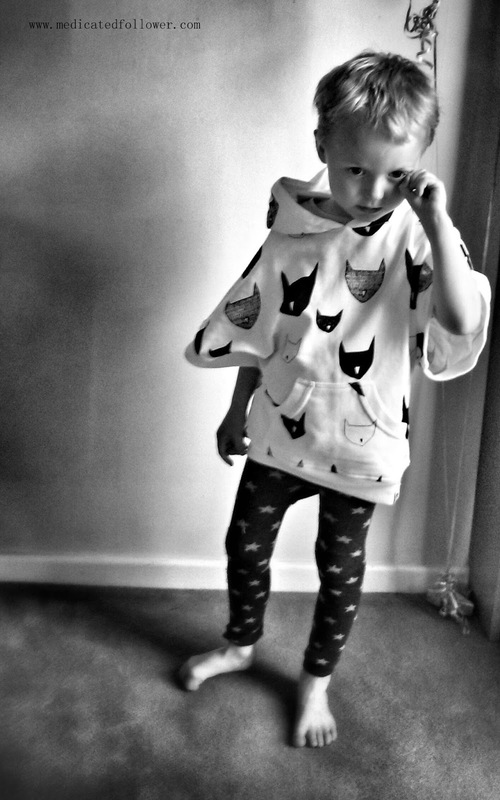 It's over to you - what have your little fashion monkeys been rocking? Have you found any cool new shops? Link up below and don't forget to share the love, comment here, comment on others, tweet links. You know the drill!! Have a gorgeous weekend folks - I'm off to The South West Blog Social in Exeter tomorrow! Woot! A day out BY MYSELF!!! Coffee.. coffee.. 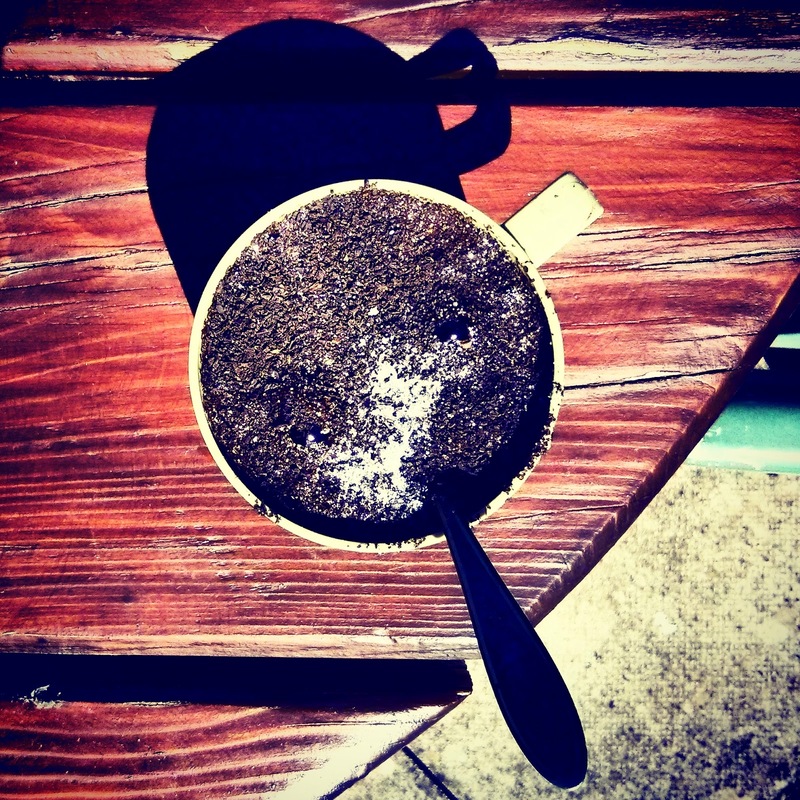 COFFEE! !